The United States Capitol building has long served as a beautiful symbol of American liberty. This tour through the inside of the Capitol will give you not only an exclusive look at the building but also a unique perspective on its history. You will be inspired by the many Godly heroes honored throughout this structure and will discover the beautiful religious artwork and engravings displayed inside. Numerous historical reenactments included in the video will bring to life those great men and events depicted throughout the building. This is a tour that you don't want to miss. Whether you're planning a visit to the capitol or simply want to know more about this majestic edifice this video is for you. Families, church congregations, students, and government officials will be enriched by experiencing the inspiring heroes and events commemorated within the U.S. Capitol building. 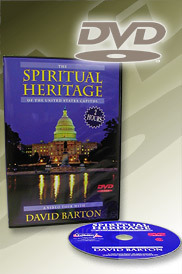 The Spiritual Heritage book (HS00205) serves as an excellent companion to the video and provides information that will enrich self guided tours of the capitol.